Can I use Site Translator to translate a CHM help file to Spanish, French, German, and Italian, without losing the original formatting from the English help file? 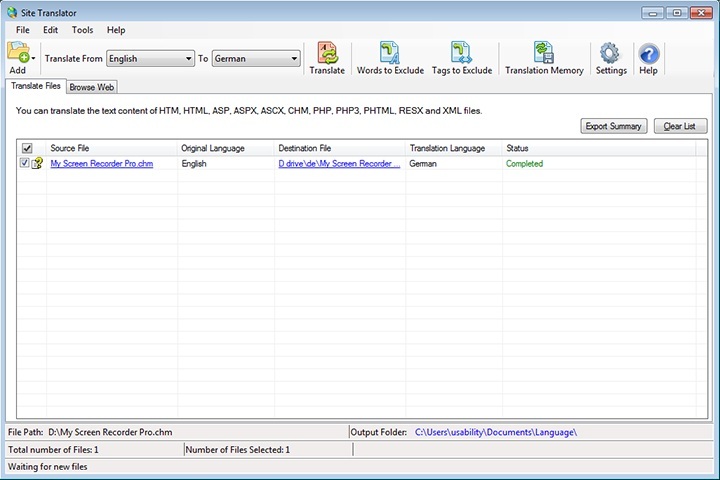 Site Translator allows you to translate a CHM file in any of the available languages. It will preserve the structure and formatting of the original file even after translation. To translate CHM file, go to File >> Add >> Files to Translate. Select the CHM file to translate. Then on toolbar look for ‘Translate From <language 1> To <language 2>’ dropdown. You have to select the language in which you want to translate your file to. Next click Translate to begin the translation. When the file is translated, the destination file will be hyperlinked. You can click on the link to view the translated file. The structure and formatting of the original file will be maintained in the translated file.